George was born November 1, 1790, to Joseph and Eleanor Cochran Junkin on the family farm near Harrisburg, Pennsylvania. The spiritual ancestors of the Junkins were Covenanters that had entered the American colonies among the Scots-Irish. Eleanor Junkin was surely a busy mother because her fourteen children would have required every second of every day. Eleven of the ten sons and four daughters survived to marry and have their own families. One of his considerably younger brothers, David, would become known as D. X. Junkin and become a minister like George. Joseph was a prosperous farmer as well as a successful entrepreneur who operated a mill, ferry service, and other interests. George’s early education was received for several years from William Jamieson who walked with the assistance of a crutch. The local children gathered for class in a log school house about a mile and a half from the Junkin home. Along the two longest walls of the cabin there were log-high gaps above the students’ desks that allowed them to see outside and enjoy the Pennsylvania scenery as they labored over their books. George said of his teacher that he was “a beautiful penman, a pretty good teacher, truly benevolent, and therefore greatly beloved.” Following Master Jamieson’s teaching George received further instruction from a succession of teachers—including one who prayed to close the school day only when he was drunk enough—George completed his studies and was hopeful that he could at some point go to college. As George anticipated the possibility of further education, the family moved west about 250 miles from their Harrisburg area property to a more remote location on Hope Farm near Mercer. For three years George worked intermittently as a carpenter, jointer, farmer, sawyer, miller, and carder. George commented that on his family’s farm it was common that the harvesters drank whiskey as they cut and gathered the grain—keep in mind that the instrument for harvesting the crop was a razor-sharp scythe (see, “Notes” regarding Whiskey Rebellion). After a few years, George’s interest in college studies induced him to discuss additional education with his father. Joseph was opinionated and was particularly against his son going to college. However, his mother interceded and convinced her husband that college would be good for their son, so George entered Jefferson College in Canonsburg, south of Pittsburgh, beginning his studies with a heavy dose of remedial Latin. He pressed on through the full curriculum, completed his examinations, and graduated in September 1813. During George’s college years, he had professed his faith in Christ and came to believe that he was called to the ministry. The month after graduation George left his rural home and headed east to New York to study for the ministry in the Associate Reformed Seminary operated by John Mitchell Mason (1770-1829). He travelled on horseback crossing the Susquehanna River by ferry at Harrisburg, then proceeded to Lancaster where he held an auction in the street to sell his horse and tack before taking the stagecoach to Philadelphia. When he arrived in Philadelphia he met a young man named John Knox—a good name for a Presbyterian seminarian—who was returning to Mason’s seminary for his second year. After a few days in Philadelphia, the students boarded a stagecoach headed for New Jersey and then the next day continued on to New York. The years in New York required some adjustments for George as he transitioned from his western Pennsylvania home life to the challenges of living in the big city. whiskey drinking was almost universal. A funeral even could not be conducted without the circulation of the bottle and the tumbler. Elders of the church deemed it not inconsistent with their Christian profession or their official position, to engage in the manufacture and sale of whiskey. Pastor Junkin cared for his congregation and continued his ministry in the Milton Church for eleven years before leaving pastoral ministry for educational service. George Junkin’s continued interest in and gifts for education resulted in his election in 1830 to the presidency of the Pennsylvania Manual Labor Academy. The school was located in Germantown which is currently a part of the city of Philadelphia. The position was accepted and in early August the Junkins moved to their new home. But his tenure was brief, because he was elected to and accepted the presidency of Lafayette College in spring 1832. The trouble was, Lafayette College did not exist and was in the planning stages. The board was hopeful that Rev. Junkin had the ability to develop its vision for the college in Easton. Up for the challenge, George Junkin accepted the appointment, moved once again, and took with him the Pennsylvania Manual Labor Academy to become a part of the student body. During his time of service to Lafayette College, Rev. Junkin became particularly concerned about doctrinal issues taking place in the Presbyterian Church in the United States of America (PCUSA). While in Milton, he had left the Associate Reformed Synod to become a member of the Presbytery of Northumberland of the PCUSA, but since his move to Germantown he had been a member of Second Presbytery of Philadelphia. 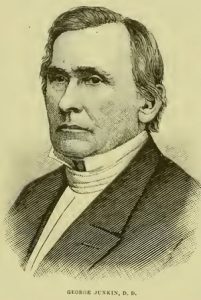 Another member of his presbytery was the minister of First Presbyterian Church, Philadelphia, Albert Barnes, who had published theological views that George Junkin and others realized were contrary to the church standards. Junkin brought charges against Barnes; a decided majority of presbytery acquitted him; but then on appeal to the synod he was found guilty and was suspended from the ministry. The final appeal was to the PCUSA General Assembly which by a close vote reversed the decision of the synod and restored Barnes to his ministerial duties. The assembly had concluded that the problem with Barnes’s teaching was a poor choice of words in his writings resulting in the impression that his teaching was unorthodox. Dr. Barnes was advised by the assembly to be more precise with his terminology. This decision was not well received by George Junkin nor other Old School members of the PCUSA, and the Barnes case became a key factor contributing to the division of the denomination into the Old and New Schools in 1837. Having built Lafayette College from the ground up, George Junkin was unanimously elected in the spring of 1841 by the Board of Trustees of Miami University, Oxford, Ohio, to become its next president. The Miami trustees were particularly concerned that he should restore proper discipline and increase the academic level of the curriculum. During his few years in Ohio, Junkin worked to fulfill the mandate of the board, but meanwhile back at Lafayette College some were gathering support to return Junkin to the president’s office. He was re-elected president in the fall of 1844 and he returned to Easton. 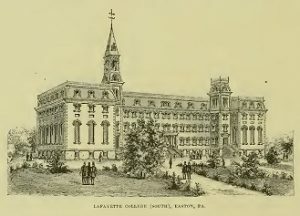 Under his administration the College steadily grew, but, as with so many of the educational institutions of the day, Lafayette continued to have difficulty raising sufficient funds to maintain its campus and improve its program. Knowledge of Dr. Junkin’s gifts as an administrator had spread to other areas of the nation resulting in several schools seeking him for leadership. In 1848, one of these institutions, Washington College in Lexington, Virginia, elected him to its presidency. He accepted the new position, packed up the family in Easton and moved south to Virginia. As his work progressed in Lexington the issues that would result in secession and the Civil War were developing. His family had grown to love Virginia but as the war neared he found himself torn between his political convictions and the situation that was developing in Virginia. Two of his daughters had married professors in the Virginia Military Institute that were also officers in the Lexington Presbyterian Church. Eleanor had married Deacon and Major Thomas J. Jackson in 1853, and then passed away with her infant child about a year later; the second daughter, Margaret, had married Elder and Colonel J. T. L. Preston. With the onset of war, Dr. Junkin, who was opposed to secession, reluctantly decided to relocate the family to the North. George Junkin was over seventy years old when he packed up the family property to leave Lexington and head across the Mason-Dixon Line into Pennsylvania. He drove the family carriage through Williamsport and Hagerstown in Maryland, then on to Chambersburg. During the war and through his last years he continued to serve the church by supplying pulpits, supporting the temperance movement, and promoting Sabbath observance. George Junkin died of angina pectoris, May 20, 1868. The last sermon text he is known to have preached was John 14:1, “Let not your hearts be troubled. Believe in God; believe also in me.” His wife Julia had died February 23, 1854, from a protracted and painful illness. Julia and George had nine children. Rev. Junkin had been honored with the Doctor of Divinity (D.D.) by Lafayette College in 1833, and then in 1856, Rutgers College honored him with the Doctor of Laws (LL. D.). 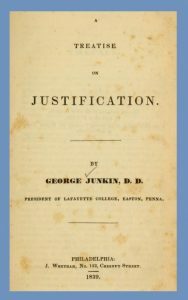 A few of Junkin’s several publications include An Address Delivered by Special Request Before the Theological Society in the Theological Seminary, Princeton, N. J, Philadelphia, 1833; A Treatise on Justification, Philadelphia, 1839; On Decision of Character: The Baccalaureate in Miami University, Rossville, 1844; Christianity, The Patron of Literature and Science, Philadelphia, 1849; An Apology for Collegiate Education: Being the Baccalaureate Address, Delivered on Commencement Day of Washington College, Lexington, 1851; The Baccalaureate Address, Delivered on Commencement Day of Washington College, Richmond, 1852; Civil Government an Ordinance of God: A Lecture for the Times, Philadelphia, 1861; A Treatise on Sanctification, Philadelphia, 1864; The Two Commissions: The Apostolical and the Evangelical, Philadelphia, 1864; The Tabernacle, Or the Gospel According to Moses, Philadelphia, 1865; and A Commentary Upon the Epistle to the Hebrews, Philadelphia, 1873. 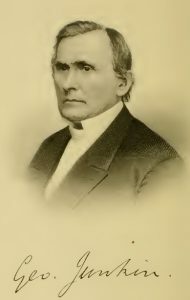 Another Presbyterian associated with Miami University and written about on Presbyterians of the Past is William H. McGuffey, 1800-1873. When Eleanor died, Deacon T. J. Jackson considered marrying his deceased wife’s sister, Margaret, but decided against it due to the prohibition against such marriages in the Westminster Confession of Faith, 24:4, as a Presbyterian Church officer he had vowed to uphold and follow the confession. Sources—D. X. (David Xavier) Junkin wrote a lengthy biography titled, The Reverend George Junkin, D.D., LL.D., A Historical Biography, Philadelphia: J. 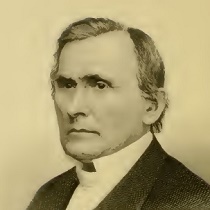 B Lippincott & Company, 1871, provided the information for this biography, the portrait, the quote in the second paragraph is from page 30, and the one about whiskey in his congregation is on page 88. The other portrait and the sketch of the Lafayette College building were found in Nevin’s Encyclopedia of the Presbyterian Church, 1884, and it is not known to the author if the building existed at the time of Junkin’s presidency, nor if it still exists.